Just a week after John Travolta’s former pilot Doug Gotterba claimed they had a six-year affair in the Eighties, Gotterba is now “considering’” writing a tell-all book. Reports that Doug Gotterba, 60, has two writers lined up to help tell his story appear in today’s edition of The National Enquirer. Last week, the National Enquirer reported that pilot Doug Gotterba told John Travolta’s former secretary Joan Edwards about the secret affair. Joan Edwards confirmed that Doug Gotterba began working for John Travolta in 1981. “He told me that John was gay and they had a sexual relationship,” said Joan Edwards. 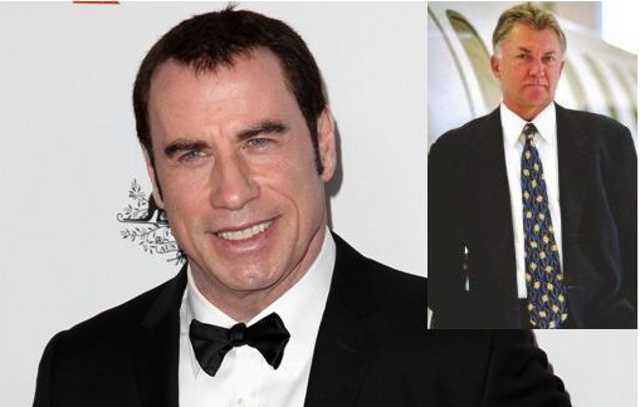 John Travolta is said to have had a long-term relationship with Doug Gotterba in the Eighties – before the actor’s marriage to Kelly Preston in 1991. The simmering scandal heated up last month, when John Travolta was hit with two lawsuits from masseurs claiming the actor made sexual advances towards them during massages – but one claim was later withdrawn. A string of other people came out of the woodwork making similar claims. John Travolta’s legal team strenuously denied the allegations at the time. In public, John Travolta, 58, has been putting on a brave face. The actor took to the stage a week ago to help honor actress Shirley MacLaine as she received the 40th AFI Life Achievement Award. The actor was perfectly composed and smiled throughout his speech, which he made in front of celebrity guests and work colleagues, including Jennifer Aniston, Julia Roberts, Katherine Heigl and Meryl Streep.